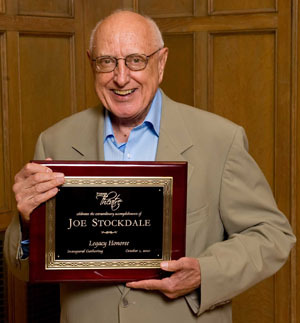 Joe Stockdale was Professor [and Dean] Emeritus of Theatre and Film, School of the Arts, SUNY-Purchase 16 ½ years; Professor of Theatre, Purdue University 25 ½ years and artistic director of the LORT Purdue Professional Theatre Co.; director of 140 shows–half with AEA actors–including Academy and Tony award winners Anne Revere, James Earl Jones, and Frances Farmer; artistic director of the Woodstock (NY) Summer Theatre for 7 seasons; directed Off-Broadway at The York Theatre Co; contributing writer for TheaterWeek, published in Dramatist, Equity, and Playbill. A story for Argosy got him a “distinctive short story, American fiction 1954” award; author of plays,Special Effects, April East and Taking Tennessee To Hart which received NY readings and regional productions; wrote the book, Man in the Spangled Pants, the 50 year history of The Barn Theatre, Augusta, Michigan, published in 2000. Joe acted in some sixty productions, appeared briefly in Larry Cohen’s film, The Stuff, three national commercials and the A&E biography Frances Farmer: Paradise Lost. He was an official observer, second season, at the Repertory Theatre of Lincoln Center for the Performing Arts; official observer at the Actors Studio under Lee Strasberg; on the National Screening Committee for the Fulbright Awards; a member of the Theatre judging panel, National Endowment for the Advancement of the Arts and visiting professor at Williams College, East Carolina University and USC, Santa Barbara. A grant by the Purdue Research Foundation allowed for travel to the USSR, Poland, East and West Germany, England and Ireland to visit theatres; a grant from the U.S. Office of Education took him to India to participate in a 2½ month seminar on music, dance, and drama. A scholarship endowment was named in his honor at Purdue where he received the Excellence in Teaching Award from the School of Humanities, Social Science and Education, and was awarded the national Samuel French Award for excellence in playwriting instruction. He is a member of the Society of Stage Directors & Choreographers, Actors’ Equity and Dramatists Guild.